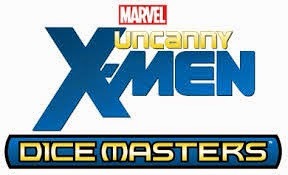 As you may have heard, I helped run a Dice Masters Uncanny X-Men rainbow draft recently. You’ve read Dave’s thoughts andseen his vlog. Here’s my side of the story, and how the event was run from my point of view. I had a couple of rules for my first event. They are mostly rules for myself, and I think they worked (or would have worked given the circumstances) out pretty well. Here they are. #1. Say “hi” and shake hands with everyone who comes. This is tough for me because I’m such an introvert. Let me stay at home, and prepare my words at a keyboard. If I do have to do something in person, then let me be quiet and fade in to the background. Sigh, no… not this time. I need to be intentional about meeting and engaging people. My little brother came with me, as he always does. Obviously, I met Dave and his wife Lauren at the event. They were easy to talk to because I’ve exchanged e-mails with Dave for months now, and also because I hear him talk on the podcast. Tangent: I’ve heard radio personalities talk about this before. How they will meet listeners of their show, and the listener just comes up and starts talking to them like a close friend. It’s because the listener hears their voice and opinions day after day after day, and feels like they know the person on the radio… even if they’ve never met. Sometimes it can come off as creepy… hopefully it wasn’t creepy. #2. Only an even number of people play for the event. I don’t like having an event with an odd number of people. An odd number of people means someone has to sit out every round, and you have to figure out how to deal with having ‘byes’ during the event. I don’t like it. So if there’s an odd number of people overall, I will sit out and just officiate. We have an even number of people, not an issue. Second tangent: During the draft itself, some cards got left in the foil wrappers when they were thrown away. We thought we were shorted, and got some extra packs, then discovered what had happened at the end when we saw we had extra dice. We rooted through the trash (nothing gross, just paper. Thankfully all of our foil wrappers were sitting right on top.) and found the cards that had been pitched. So these 6 trash-cards and their dice became our “grand prize”. The best of those cards was an uncommon Cyclops, so nothing special that we desperately needed during our draft. All of my rules and what I was focused on preparation. I didn’t realize how much I needed to prepare for actually RUNNING the event. Here’s where my friend Ken comes in. He’s run these events before, and asked if I wanted him to get on his phone and randomize the opponents real quick. Yes, excellent idea, Ken. So he did. After the first round had ended I needed to go ask the guy running the store for some scrap paper and a pen because I didn’t think about having to keep track of wins and losses. Now, I’m realizing that since we got AvX prizes, should we keep track of 6 month standings to hand out the Phoenix Force prize cards? Will it matter since we got 3 packs of month 6 prizes with 9 Phoenix Forces to hand out? Oh gosh, so many things I didn’t think of…. We randomized opponents through the first two rounds. That was a mistake. We had 8 people, so we should have done just a hard bracket tournament. My mind was flustered and I didn’t realize that until after the second round. Luckily, only 2 people had won both rounds. So for round 3, I matched those two people up, and randomized the rest of the opponents. We all played our third round matches, and everyone seemed to be having a good time despite how ill-prepared I felt. Then I made sure everyone had their prizes. The winner, Brian, got his “trash-cards grand prize” and all was right with the world. But, man... so many things I can improve on for next time. For those of you who actually want information on my draft strategy and what my team ended up looking like, you’re going to have to come back next time. The one tease for next week: I ended up with one of the most sought after draft combos in all of Uncanny X-Men, and over thought myself in to a 1-2 record. By now you guys should know how I wrap this up. Roll on. Congrats on running your first event - it'll get easier the more you do it. Any particular reason you didn't use the WizKids Event System to run the event? It would have solved your issues regarding randomizing opponents as well as deal with a bye if it came up. It's a pretty simplistic system, and you can always manually do things if the system becomes confused. I'm not exactly sure what you have set up with that particular shop, but you might look into it for the future. I didn't use the Event System because I was told it was terrible by someone else who has run events. I never looked in to it myself. I will definitely do that before my next event. I think it does ok - but I use it mostly just to track, not to actually facilitate the event. Great article, Randy! Sums up my own thoughts exactly. Congrats on your first run! I manage a store, and I use some free X-Wing Miniatures Tournament software called Cryodex, it works wonders! It does all the randomization, and you can put in final HP counts too in addition to match wins, that will help decide tie-breakers. Did you all do one round matches or best of three? We did best of three for our first event, but this Saturday in Minneapolis we'll be doing single Swiss rounds. It creates the pairings as you go through the rounds of play, so in some respects it does facilitate the event.